Two cubs born to smuggled lions are named after missile fired at Israel and the Hamas name for operation Pillar of Defense. On Tuesday authorities at Gaza's "Bissan" amusement park announced the birth of two lion cubs, naming them after the fighting in the IDF's 8 day anti-terror operation Pillar of Defense of November 2012. The first anniversary of Pillar of Defense came just under a week ago. Prime Minister Binyamin Netanyahu took the occasion to praise Israeli deterrence which has led to a 98% decrease in rocket and mortar fire from Gaza. Meanwhile Hamas marked the anniversary by calling the clash a victory and claiming preparedness for the next battle against Israel. The male and female cubs were born Monday, reports AFP. One is named "Fajr (dawn)" after the Fajr missiles Hamas fired at Israel, while the other is named "Sijil (clay)" after the Hamas name for Pillar of Defense, "Operation Stones of Clay." The cubs' parents were smuggled into Gaza from Egypt four years ago. 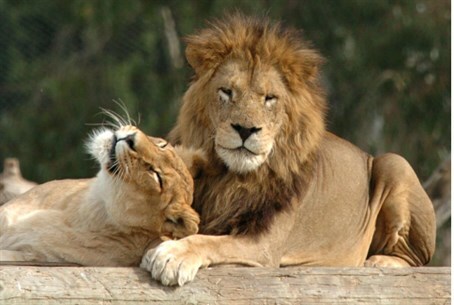 Ezzedine al-Qassam Brigades, Hamas's armed wing, took credit for smuggling the lions in. The lions are not the first animals smuggled into Gaza from Egypt. In November 2012, right before the outbreak of Pillar of Defense, reports surfaced that a 1.7 meter (5 feet 7 inches) escaped crocodile had been roaming Gazan sewers for two years and terrorizing livestock. The crocodile had reportedly been brought to Gaza as a baby. Meanwhile in October, documented abuse in the slaughtering process of animals in Gaza led to talk of ending cattle imports from Australia and Israel.